Search.hemailaccessonline.com is one of the browser hijackers that arrive bundled on users’ computers. They usually enter computers unnoticed, but users find out about their entrance relatively quickly because they use their browsers to surf the web every day. Like other browser hijackers, it alters browsers’ settings when it successfully enters the system. Users usually notice a new homepage and a search tool set when a browser hijacker enters their systems, but it is known that these infections might change other settings too, for example, set a new page in the place of a user’s New Tab page. The only way to undo the changes applied is to implement the Search.hemailaccessonline.com removal. Once it is gone from browsers, a new page could be set in its place. 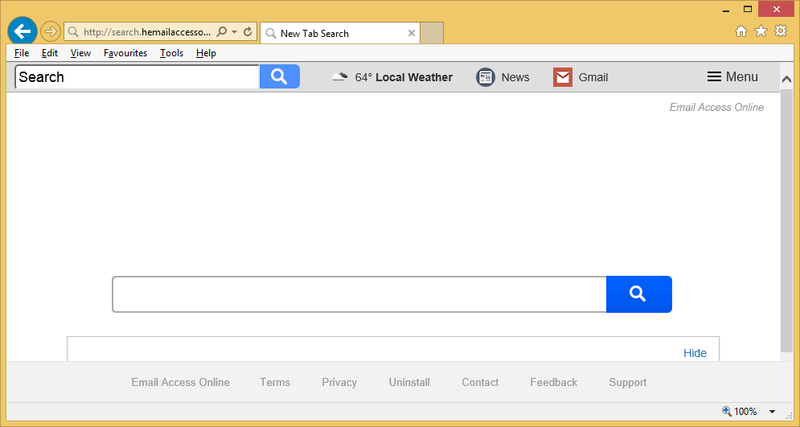 You must remove Search.hemailaccessonline.com not just because you could set a new URL as your homepage, default search tool, or New Tab page. It is advisable to get rid of it also because security-related problems might arise shortly if you do nothing about the presence of a browser hijacker on your system. Search.hemailaccessonline.com is nothing more than a browser hijacker infection, so it will simply change your all browsers’ settings when it finds a way to enter your computer. Although this website looks like an ordinary search tool and does not look dangerous at first glance, you should not use it as your default search tool by any means because you will see more sponsored links and advertisements than normal search results. All these links/ads might expose to threats by redirecting users to suspicious pages, so it is not recommended to click on them. Of course, you could fully avoid them only if you remove Search.hemailaccessonline.com from browsers. Uninstall Search.hemailaccessonline.com as soon as possible also because this search tool might steal information about you and your browsing behavior and then sell it in the black market. Where does Search.hemailaccessonline.com come from? Browser hijackers do not have official websites, so it is not very likely that users download them from the web and because of this see their browsers’ settings changed. It is more likely that these infections enter their systems bundled with freeware or shareware. Do not let the undesirable changes be applied on your browsers again – go install a security application after Search.hemailaccessonline.com removal. How do I delete Search.hemailaccessonline.com? Even though it is possible to delete Search.hemailaccessonline.com from browsers manually, we believe that this removal method might be too difficult for you because, evidently, you are an inexperienced user if you are reading this article looking for more information about the deletion of this infection. Consequently, we recommend deleting Search.hemailaccessonline.com automatically. You only need to have an automatic anti-malware or anti-spyware tool to do this. If you do not have such a tool yet, you can download it from the web at any time. Just keep in mind that not all tools advertised as reliable scanners can really help you, so be very careful.